For protecting ourselves from such misperception, we need intelligence. But the intelligence to avoid misperceptions is not enough to see through the foundational illusion that binds us to material existence. This deep-rooted illusion, which is brought about by the illusory energy known as Maya, is not illusion in perception – it is illusion in conception. What is this misconception? The notion that things exist independent of Krishna, that they have their own attractiveness separate from him, and that they can in and of themselves provide us happiness. The Bhagavad-gita (10.41) states that all things owe their attractiveness to the all-attractiveness of Krishna. In fact, all things owe their very existence to him (10.39). Srimad-Bhagavatam underscores this understanding of Maya as illusion in conception. In its four verses celebrated as the Chatur-shloki-Bhagavatam (2.9.33-36), the second verse (2.9.34) declares that whatever is disconnected from Krishna and is still seen as meaningful is Maya. 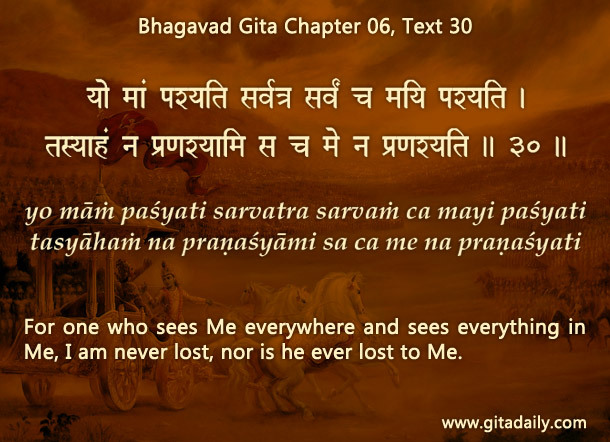 Echoing this understanding from the opposite perspective – the perspective of those free from illusion – the Gita (06.30) states that those who see everything in Krishna and Krishna in everything are never lost to him. As Maya is the misconception that makes us see things separate from their source, the best process for countering Maya is the process that focuses our consciousness on the source. That process is bhakti-yoga. Devotional practices infuse our consciousness with remembrance of Krishna, thereby enabling us to see everything in connection with him. When our foundational misconception is thus uprooted, we march straight and strong towards enlightenment and liberation. Why look at a mirage when heading to the oasis? By relating the Catur Sloki verse of SB to this BG verse, the understanding of this verse has got enriched. Thank you Prabhu.